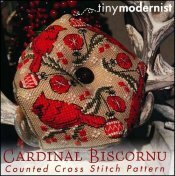 Cardinal Biscornu [W7249] - $6.00 : Yarn Tree, Your wholesale source for cross stitch supplies. Cross stitch pattern from Tiny Modernist. Cardinals appear when an angel is near. What a beautiful design to gift someone that has lost a loved one. This "Cardinal Biscornu" is absolutely gorgeous! Bright red Christmas ornaments hang down from the tree limbs that the cardinals are standing on. Gentle snowflakes fall from the winter sky. Stitch count is 65H x 65W. Curved Lavender Cotton Candy Embroidery 3 1/2"